CHICAGO (Jan. 10, 2018)— Cat’s Pride today announces its national “Litter for Good” program as part of its long-term commitment to help save America’s shelter cats through partnerships with and donations to animal welfare organizations across the country. 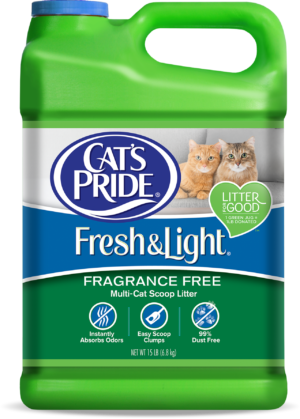 The Litter for Good program encourages consumers to nominate their favorite animal shelters to receive free litter at www.catspride.com/litterforgood and to purchase a green jug of Cat’s Pride Fresh & Light litter. For every green jug sold, Cat’s Pride will donate a pound of litter to shelters nationwide to help animals in need, with the goal of five million pounds of litter donated this year and twenty million pounds by the year 2020. The program addresses a critical need in the shelter community, where 3.2 million cats enter shelters every year and over half are euthanized. Cat’s Pride is committed to Changing Litter for Good, by developing innovative, high-performance products, minimizing the environmental impact of its business, and supporting the work of animal welfare organizations nationwide. Oil-Dri Corporation of America (NYSE: ODC), a leading supplier of specialty sorbent products for the animal health, fluids purification, agricultural ingredient, sports field, industrial and automotive markets and has more than 75 years of sorbent mineral expertise. Oil-Dri is a leading manufacturer of cat litter. “Cat’s Pride”, “Fresh & Light”, “Fresh & Light Ultimate Care” and “Changing Litter for Good” are registered trademarks of Oil-Dri Corporation of America. “Litter for Good” and “LOOK FOR THE GREEN JUG” are trademarks of Oil-Dri Corporation of America. From research and development at our Innovation Center outside of Chicago to our manufacturing plants in Georgia, Mississippi, Illinois and California, our Cat’s Pride products are proudly made in the USA. For more information, visit www.oildri.com or www.catspride.com.